Leave a comment or share your own riddle with us. 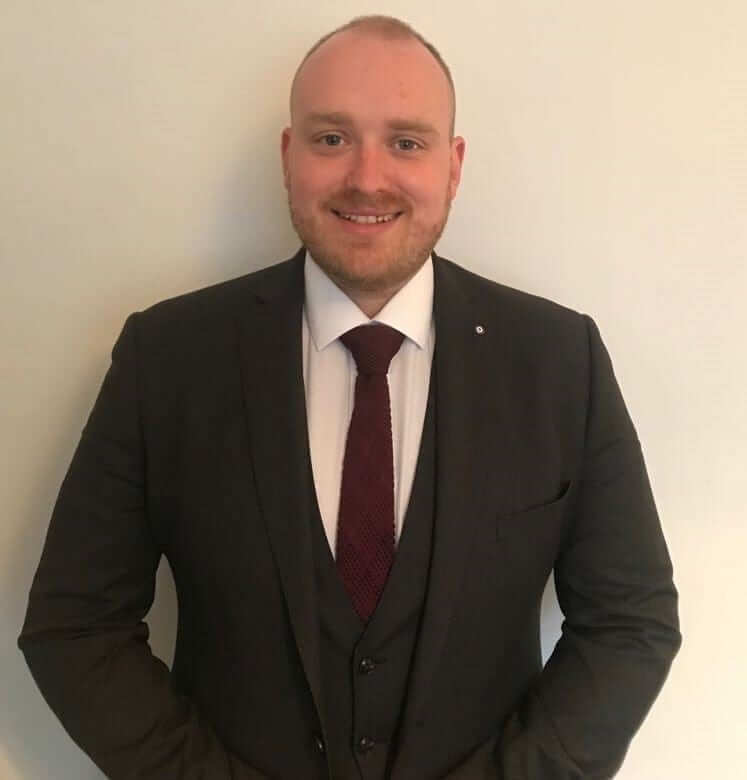 STAR Translation is delighted to announce that James Davies joins our team as Business Development Executive for Translation Tools and Technology in Dublin, Ireland. James comes from Australia where he was previously involved in technology sales. 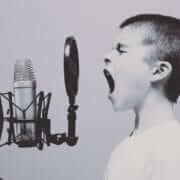 He is responsbile for sales of our translator tools; such as STAR Transit NXT, TermSTAR and MindReader. We’re looking forward to seeing his new Webinar series on Transit and other technology to help translators get the most from their systems and grow their translation business. Want to know more about our translation tools? 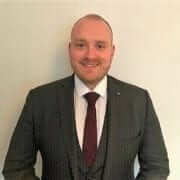 If you’re based on Ireland or the UK and would like to reach out to James you can connect to him on Linked and start the conversation. Learn more about our translation technology and tools. 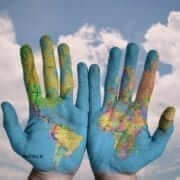 Which country has the largest number of languages ​​spoken? At first, you might think of the country with the largest population, but surprisingly, the answer is not China, India or any other big country. It is Papua New Guinea. It’s a country of only 462,840 square kilometers with a population of just over seven million. Despite its small size, this country has an incredible linguistic diversity with 820 languages ​​spoken. As the French Open starts here are some interesting facts for tennis fans. Roland Garros is named after a French fighter pilot who was acknowledged as the first man to fly over the Mediterranean Sea. In 1968, it became the first Grand Slam tournament to allow amateurs and professionals to compete on equal terms. The youngest French Open winner was Monica Seles at the age of 16. The longest match ever was between Fabrice Santoro against Arnaud Clement in 2004. It lasted 6.35 and was won by Santoro. 1. In the food processor, mix flour and baking powder. Add the butter and mix for a few seconds at a time, until the butter is the size of peas. Add the water, egg and mix again until the dough just starts to form. Add ice water as needed. Remove the dough from the robot and form a disc with your hands. 2. On a floured work surface, lower the dough. 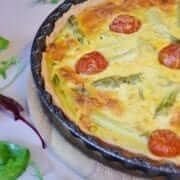 Darken a quiche dish 10 inches (25 cm) in diameter. Fold the excess dough inwards, pressing to double around. Using a fork, prick the bottom of the crust. 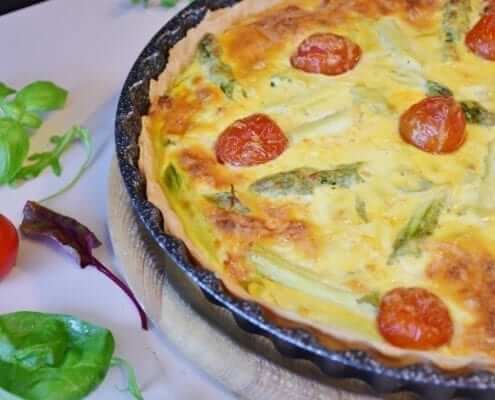 Refrigerate 30 minutes or freeze 15 minutes. 3. Place the rack in the bottom of the oven. Preheat the oven to 190 ° C (375 ° F). 4. Meanwhile, in a frying pan, brown the bacon. Add onion and continue cooking until tender. Drain the cooking fat. Let cool. 5. In a bowl, combine the cream and eggs with a whisk until the mixture is smooth. Add the bacon mixture and the cheese. Salt and pepper. What’s Another Year? Test your Eurovision Knowledge! How well do you know your Eurovision Song Contest? Are you a EuroSTAR or a Nul Pointer? Take our Quiz to find out!!! https://www.star-ts.com/wp-content/uploads/2018/05/microphone-1209816_960_720.jpg 640 960 Star Translation /wp-content/uploads/2018/04/STAR-logo-orig.png Star Translation2018-05-11 14:44:222018-05-11 14:46:15What's Another Year? Test your Eurovision Knowledge! To translate a document using Transit, you must first create a project. A wizard helps you to do this by guiding you step-by-step through the functions so you cannot forget any settings. – The option Based on template allows you to select from a list of user-defined project templates and adapt these to suit your current project. Please refer to section 5. “Creating a new project template” for more detailed information on creating a new project template. – The option New project from scratch lets you create a new project from scratch. Please refer to section 2. “Creating a new project” for more information on this topic. You can create a follow-up project. Using the option Based on project, you can create a follow-up project. With this option, Transit suggests the settings of an existing project so you only have to change the settings which differentiate the new project from the old project. Please refer to section 3 “Create a new project based on an existing project” for more information on this topic. You can create an alignment project. 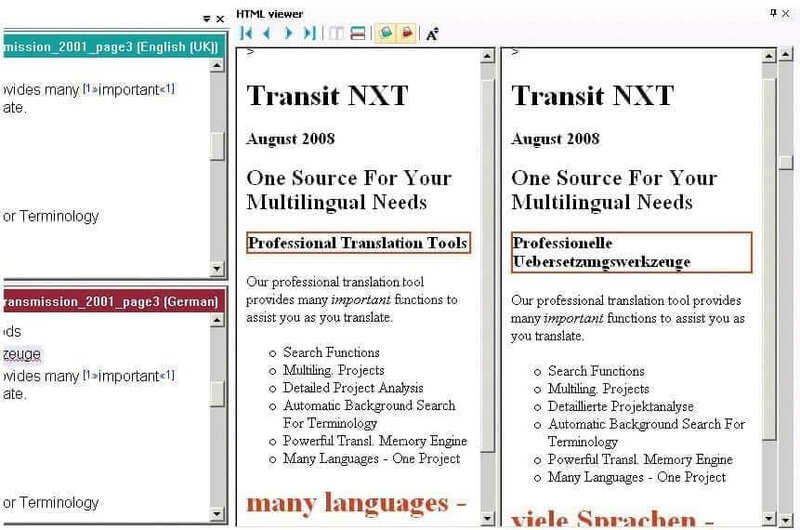 If you have an original and one or more translated versions of a document, with the option Alignment project, Transit gives you the option to create reference material from these original documents, which you can then use for translation projects in Transit. You also have the option of creating an alignment project using the resource bar. 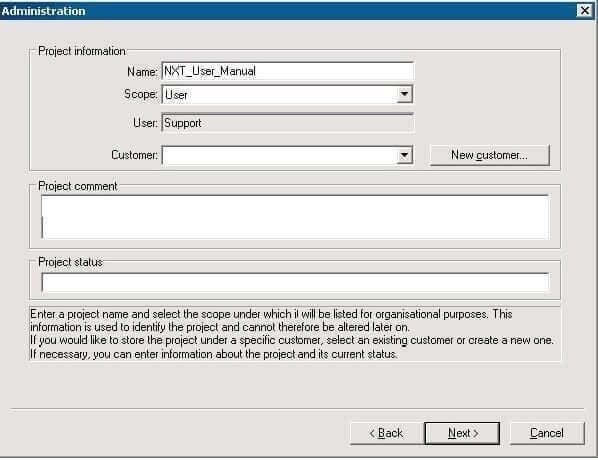 You can find more detailed information about creating alignment projects in chapter 2 of the “Transit NXT Alignment Tool” manual. When you create a project in Transit, this is also used by the TermStar terminology management system. The Transit project also contains all the settings which TermStar requires. This means that if you want to use or edit terminology for a translation project, there is no need to create a separate project in TermStar. Selecting Project | Administration | Create in Transit gives the user the option to create a new project from scratch or a project based on a template. It is also possible to select predefined default project templates using the Interfaces button in the resource bar, which you can then adapt for your project (details about this can be found in section.4 “Creating a new project via the resource bar”). Please refer to section 3 “Create a new project based on an existing project” if you want to create a follow-up project based on an existing project. If you wish to create a new project template, please refer to section 5 “Creating a new project template”. Transit provides you with project templates that are specific to the document type, which means that you do not have to make certain settings when you create a new project. Alternatively, you can also create your own project template. This is achieved either by taking an existing project template and amending it accordingly, or else by creating an entirely new project template from scratch. Please refer to section “Creating a new project template” for more detailed information on this topic. 1 Select Project | Administration | Create. 2 To create a new project, select New project from scratch. Click Next to confirm the option selected. 3 Specify the administrative information. Global, User (user-related) or Customer (customer-related). – If you have selected Customer from the Scope list, select the desired customer from the Customer list. Enter the name of the customer in the Customer field. Transit automatically copies the name into the Customer data folder field. Transit saves customer-specific settings to this folder. Click Create customer to confirm the information entered for the new customer. Transit displays the Administration window again. You can now select the new customer from the Customer list. – You can enter a comment on your project in the Project comment section. – In the Project status section you can enter remarks on the status of the project, such as ‘Imported’, ‘Statistics created’, ‘Imported and checked before translation’, ‘Sent to translator’, etc. Click Next to confirm the information entered in the Administration window. 4 Specify the source and target language(s) for the project. – Source language – Select the language you require from the list. – Current target language – Select the language you require from the list. 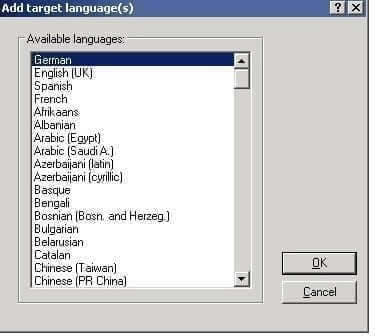 You can only select languages specified as ‘Project target languages’. When creating a new project, it is first necessary to add the required languages in the Project target languages section. 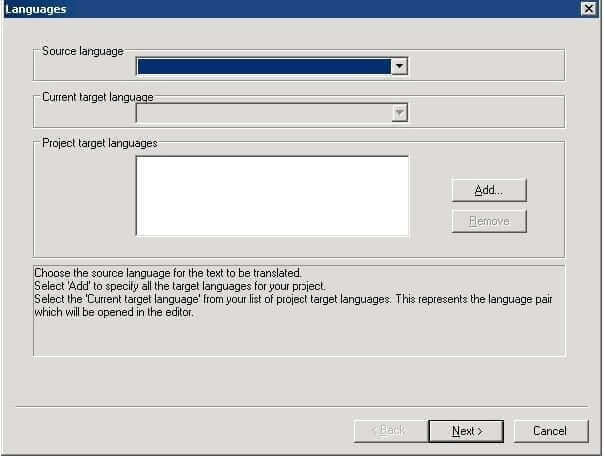 – Project target languages – Transit displays all the target languages for the project in the Project target languages section. Select one or more languages which you want to add to the project as target languages. To select several target languages, press and hold the CTRL key and then click on the desired languages in the list. They appear highlighted. Confirm your selection with OK.
– To remove a target language from the project, select the language in the Project target languages section and click Remove. This does not cause Transit to delete the files for the removed target language, it just means that the language is no longer used in this project. Click Next to confirm your settings in the Languages window. 5 Specify the working folder which Transit should use to save all the files for this project. Transit initially creates the appropriate folder as a subfolder of Projects in your Transit installation folder. This path for this folder is displayed in the Folders window. – If you would like to store the project in a different folder, select the Browse option. Transit displays the Folders window again. By default, Transit creates a subfolder of the project folder to serve as the export folder (e. g. .\EXPORT\ENG). However, it is also possible to select a different folder. – Under Export folders for project target languages, click on Change. Transit displays the Export folder window. Transit displays the Select export folder window. – Select the desired folder and confirm by clicking Open. Transit displays the path for the new folder in the Export folder window. – Confirm your selection by clicking OK.
Click Next to confirm the information entered in the Folders window. 6 The window initially displays the default file type. You can now specify the type of file that you want to import. 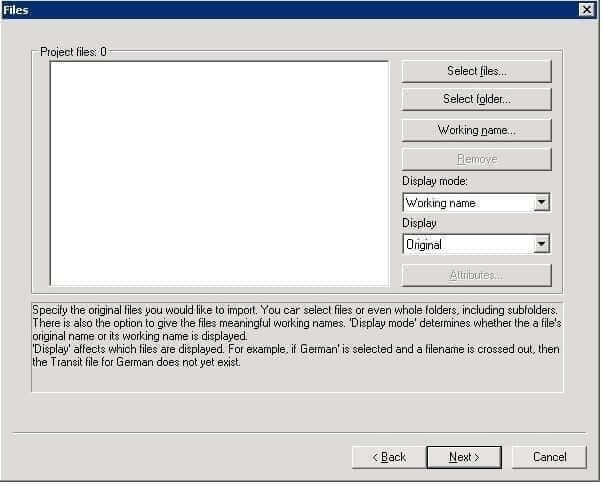 – If you want to import a different file type, select the desired file type from the File type list. To limit the choice of available options (for example, because you are searching for particular file types or for data for a particular customer), you can restrict the list using the Preselection (optional) section. – Font mapping lets you assign particular fonts to the target-language document which is to be created. – Click on Options to configure additional settings for your particular file type (not available for all XML, HTML, SGML, Text and GRIPS file types). Transit displays the File type settings window. Specify the settings required and confirm the settings by clicking OK. Please refer to the 3.6.8 “Additional file type settings” section and the “Tips & Tricks for All File Formats” manual for information on other settings for specific file types. Click Next to confirm the settings made in the File type window. 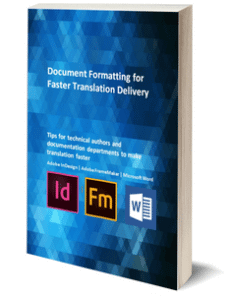 7 Specify which files you want to import and translate in Transit. – If you wish to select individual files, click Select files. Transit displays the Select original files window. Select the desired files and confirm the selection by clicking Open. – If you wish to select all the files in a folder, click Select folder. Transit displays the Select folder with original files window. Select the desired folder. Select Include subfolders if you want Transit to import the contents of all subfolders as well. – If you want to remove a file or a folder from the project, select the file/folder and click Remove. 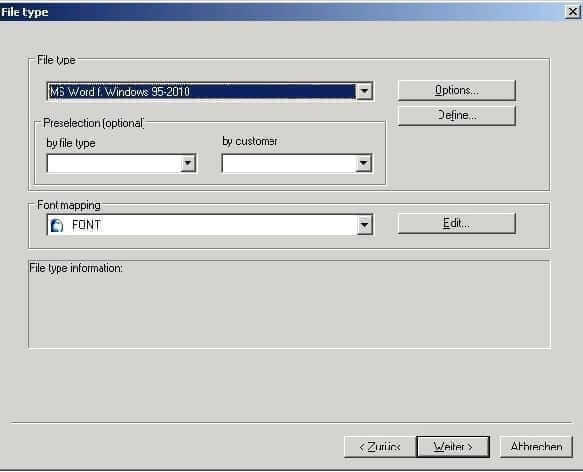 – If you want to assign a working name to a file, select the file and click Working name. Enter the desired working name into the Working name field. Confirm your entry with OK. Working name – Transit displays the working name. Original name – Transit displays the path and original name of the file. – From the Display list, select the files which Transit should display in the Project files section. Transit then indicates in the Project files section whether the corresponding language files already exist. If the files do not yet exist, it may be that they still need to be imported for the language selected. If you are creating a new project, the source and target-language files will not usually be available, as you have not yet carried out an import. 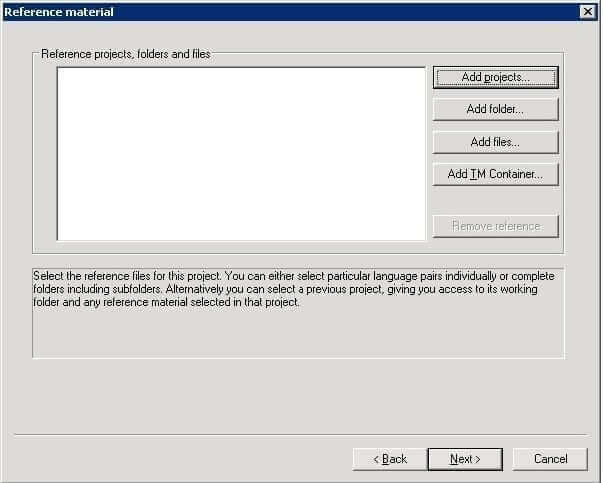 – If you want to specify specific attribute values for the added project files, click Attributes. By doing so, you provide the project files with additional information that you can use later on – for importing them into a TM Container and exporting them as TMX files. For further information on this please refer to the “Transit NXT – Managing and using TM Containers” manual. Click Next to confirm the settings made in the Files window. – To select a project as reference material, click on Add projects. Transit displays the Project browser window, which lists all existing projects. Select the desired project. Confirm your selection with OK.
– To select all the files in a folder, click Add folder. Transit displays the Select reference folder window. Select the desired folder. If the folder contains subfolders, they are automatically included in the selection. – To add individual files as reference material, click on Add files. Transit displays the Select reference files window. Select the desired files and confirm the selection by clicking Open. – To add a TM Container or TM Filter as reference material, click on Add TM Container. Transit displays the Add TM Container window. Select the desired TM Container or TM Filter and confirm by clicking Select. The Add TM Container button for adding a TM Container or TM Filter as reference material is only available if the TM Container function has been activated for your licence. If you have any questions on this, please contact your local STAR office. – If you want to remove a project, folder or file from the list of already selected reference material, select the corresponding entry and click Remove reference. Click Next to confirm the settings made in the Reference material window. 9 From the Current dictionary list, select the dictionary to which Transit should add any new terminology. 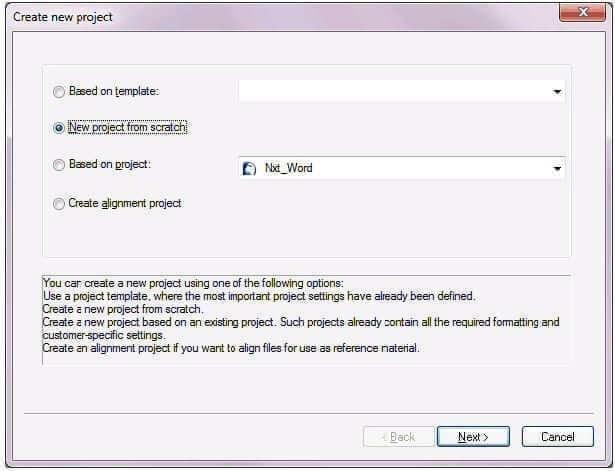 In doing so, you can only select a dictionary which has been specified as a project dictionary. If the required dictionary is not contained in the list, you must first add it to the Project dictionaries section. To assign a dictionary to the project, click on Add in the Project dictionaries section. In the Select dictionary section Transit displays the dictionaries that you can access. In the right column Transit displays the name of the database in which the respective dictionary is saved. 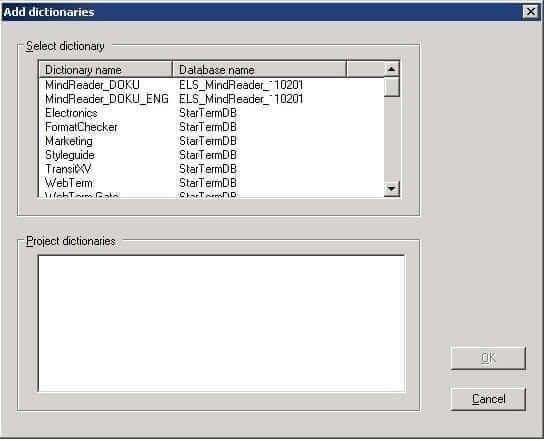 By clicking on the column header Dictionary name and Database name you can sort the dictionaries or the databases alphabetically ascending or descending for a better overview. In the Project dictionaries section Transit displays the dictionaries that are already defined as project dictionaries. – In the Select dictionary section, select one or more dictionaries which you want to add to the project. Confirm your selection with OK. Transit displays the Dictionaries window again with the dictionaries added. If necessary, you can now select a different current dictionary. – To remove a dictionary from the project, select the dictionary in the Project dictionaries section and click Remove. Transit will not delete the dictionary data from the database when a dictionary is removed, it will merely no longer use the dictionary in this project. Click Next to confirm the settings made in the Dictionaries window. – Click on Back if you want to change a setting. 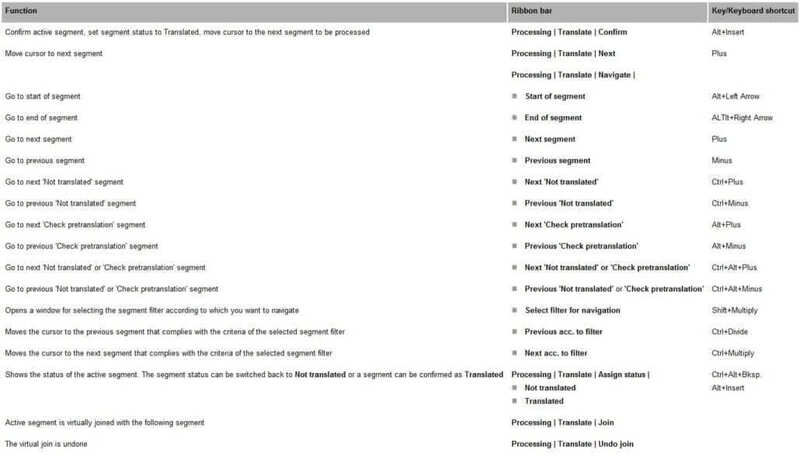 – If you want to make additional special settings for segmentation, report settings, format check, default values, reference material, pretranslation or extracts, click Additional options. Segmentation – Options for splitting the text into individual sections (segments). Please refer to section “’Segmentation’ project settings” for more detailed information. Report settings – Settings for the Report Manager for analysing and invoicing your translation project. Please refer to section “’Report settings’ project settings” for more detailed information. Format check – Options for verifying the consistency of formatting information, the representation of numbers and for detecting missing or redundant spaces. Please refer to section “’Format check’ project setting” for more detailed information. Default values – Default values for dictionary entries made while working on the project. Please refer to section “’Default values’ project settings” for more detailed information. Pretranslation – Settings for pretranslation based on the reference material. Please refer to section “’Pretranslation’ project settings” for more detailed information. Extracts – Settings for the creation of reference and translation extracts. Please refer to section“’Extracts’ project settings” for more detailed information. 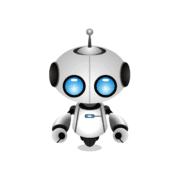 Machine translation – Generating translation suggestions using MT systems during import. Please refer to section “’Machine translation’ project settings”. Configure the desired settings and confirm them by clicking OK. Please refer to section “Project settings” for more information on this topic. Once you have checked all the settings, confirm them by clicking Finish. Transit creates the project with all the files and folders. Project created successfully. Do you want to start the import process now? – Click Yes if you want to import the files straight away. Transit displays the Import project window. – Click No if you want to import the files at a later stage. You can carry out the import process at a later stage. However, you must import the files before you can start the translation. If you choose to create a project based on an existing project, Transit suggests the existing settings from this project so you only have to modify the options which differentiate the new project from the old one. Please refer to section 2 “Creating a new project” if you would instead like to create a new project based on the default Transit settings. How do I create a new project based on an existing project? 2 To create a follow-up project, select Based on project. 3 Select the project from the list which you want to use as the basis for your new project. Click Next to confirm the option selected. As the project name, Transit suggests the name of the old project with 1 appended to the end. The language pairs and reference material from the old project are set as the reference material, the old import files are discarded. All other settings from the old project remain unaltered. 4 Accept the suggested settings or change the settings for the new project. To do so, proceed as when creating a new project (see section 2 “Creating a new project” from step 4 onwards). Project folder: Transit automatically saves the project to C:\Program Files\Transit_NXT\projects\. 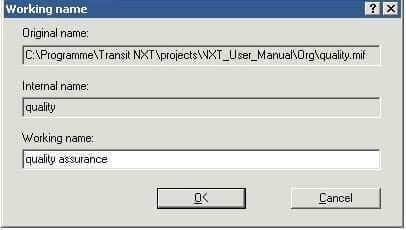 For the project name, Transit uses the name you have entered under Project name in the Administration window. File type: The file type is preselected when you choose the project template. Dictionary: The project wizard skips the Dictionaries window when you create a project via the resource bar. Clicking the Additional options button in the Summary window takes you to the advanced project settings. Here, you can make further project settings before you finally create the project. You can also change the settings at a later stage via Project | Administration | Settings. Please refer to section 2 “Creating a new project” if you would instead like to create a new project based on the default Transit settings. How do I create a project via the resource bar? 1 Click the Interfaces button on the resource bar. 2 Select the desired file type from the list (e. g. Office -> PowerPoint). 3 Specify the administrative information and proceed in the same way as when creating a new project. These options are also available from the ribbon bar by selecting Project | Administration | Create | Based on template. You can also define project templates yourself in Transit according to your specific requirements. 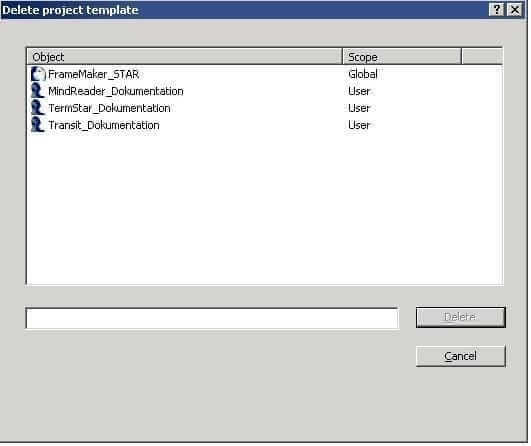 When you create a new project template, you can either create a template from scratch or base it on one of the default project templates that is available in Transit when you create a new project either via the ribbon bar (Project | Administration | Create) or via the resource bar. How do I create a project template via the ribbon bar? 1 Select Project | Template | Create. – Create new template – Select this option if you want to create a new template from scratch. 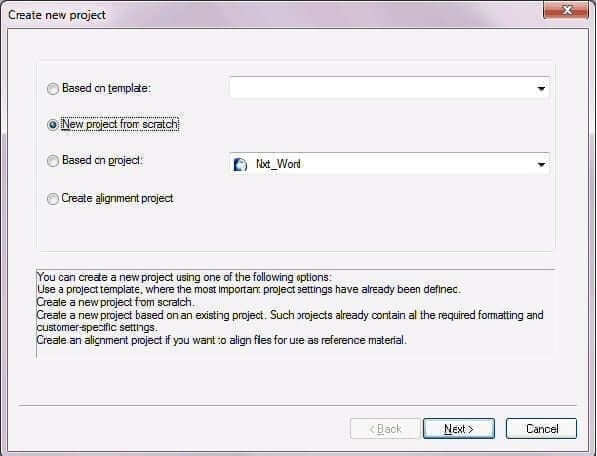 – Create new template based on template – Select this option if you want to create a new template that is based on one of the default project templates. 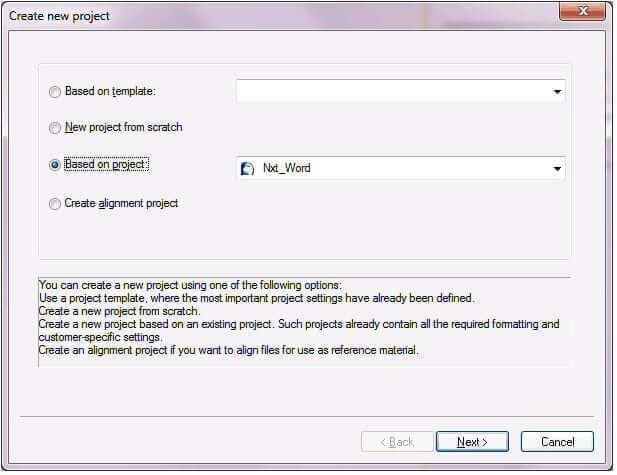 Select the required default project template from the list. 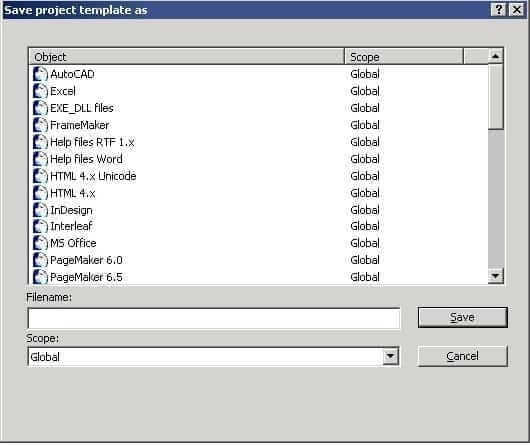 – File name – Enter the name of the project template here. 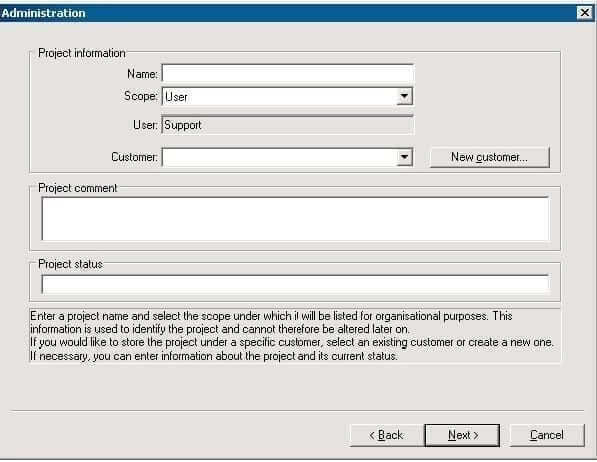 – Scope – Select the scope to which the project template should be assigned: Global, User (user-related) or Customer (customer-related). Click Save to confirm the information specified. The name of the project template and the scope in brackets (e. g. Global) are also shown in the titlebar. 5 Make the required settings in the other tabs. Confirm the settings in each tab with Apply. Click OK to conclude the project-template creation process. User-defined project templates can also be deleted. The project templates supplied with Transit, which are specific to particular document types, cannot be deleted. How do I delete a project template via the ribbon bar? 1 Select Project | Template | Delete. The list of the available project templates only displays the user-defined templates. The Delete button is greyed-out until a template is selected. 2 Select the project template which is to be deleted. If you create a new project from scratch, Transit suggests various default settings (e.g. for the source and target language; see section .2 “Creating a new project”). 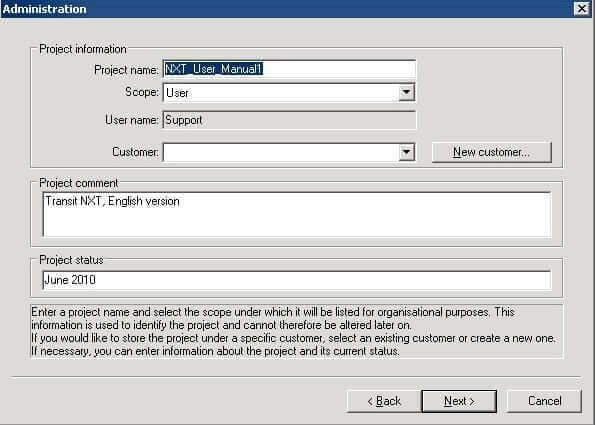 You can change the default settings suggested by Transit for new projects, so that they match the requirements of your projects as closely as possible. This means that less changes will be necessary when creating a new project. 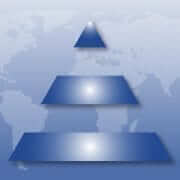 The default settings come from the project default, stored under scope Global. 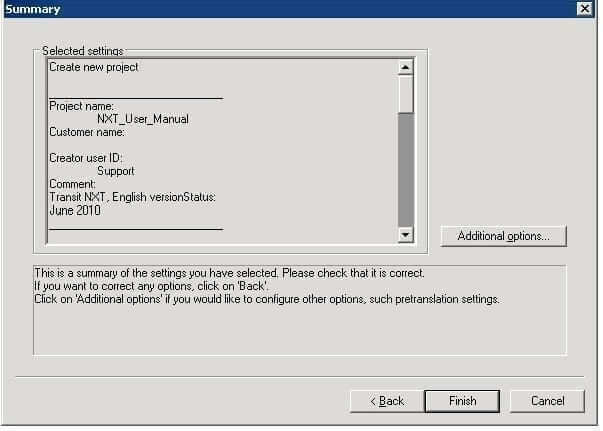 To change the settings, open the project default, alter the project settings and save it again under the same name. How do I change the default settings? 1 Open the project default, which is stored under the scope Global. – To do this, select Project | Open. – Select the project default from the list. If Transit displays several projects of this name, select the default project stored under the Global scope. Transit opens the default project. 2 Check the project settings and alter them as necessary. – Select Project | Administration | Settings. Transit displays the Project settings: default (Global) window. On the tabs, Transit displays the project settings which are suggested when a new project is created. – Alter these project settings as necessary so that Transit will suggest these modified settings for future projects. Only alter those settings which are useful as suggestions for all new projects (e.g. for the source and target language). – Do not change any settings which usually differ from one project to the next (e.g. files, reference material, dictionaries, default values, etc.). You will find information on the project settings in section 3.6 “Project settings”. – Confirm the changes made with OK.
3 Save the modified project default. – Select Project | Save as. Transit displays the Save project window. – Click Save to confirm your choice. Transit displays a message informing you that the project already exists. 4 Click OK to confirm that you want to overwrite the existing project. Transit saves the default project and its settings are the immediately available to act as suggested settings for new projects. If the language pair is open, the text appears in the editor window in two panes – green for the source language and red for the target language. 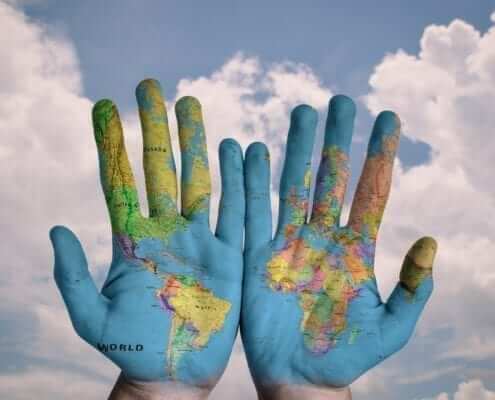 When you begin translation, the majority of the text in the target-language pane is usually not translated and is therefore still in the source language. If Transit has found matching segments in the reference material during the import process, these segments will already have been pretranslated. In the target language window, you now can overwrite the text which is still to be translated. Transit shows the corresponding source language text in the source language window. How do I translate a text in the Transit editor? 1 In the target-language pane place the cursor in front of the text you wish to translate. 2 Enter your translation and delete the old text. Transit indicates which options are currently selected with a checkmark to the left of each selected option. Should you wish to deselect an option, simply remove the respective checkmark by clicking on the option in question. – Delete to end of segment – Here you can specify whether the old text should be deleted automatically when the translation is confirmed. The Delete to end of segment option is the default. If it is selected, when you click on Confirm or press the shortcut ALT+INS, Transit will automatically delete the remaining, red-underlined source text from the segment. – Check spaces – Here you can specify whether Transit should check for a space at the end of the source and target-language segment when the translation is confirmed and display respective messages in case of inconsistencies. – Check end punctuation – Here you can specify whether Transit should check for punctuation signs at the end of the source and target-language segment when the translation is confirmed and display respective messages in case of inconsistencies. – Empty next segment – Here you can specify whether Transit should empty of contents of the respective following segment when the translation is confirmed. If the Empty next segment option is selected, when you click on Confirm or press the shortcut ALT+INS, Transit will automatically empty the following target-language segment. 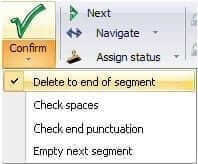 Selecting this option deselects the Delete to end of segment option. – If Transit finds an entry in the dictionary for a word in the segment, this word is highlighted in yellow in the editor. In addition, Transit displays the entry in the Terminology window. – Press the shortcut ALT + ENTER if you want Transit to display a suggested translation from the fuzzy index for this segment. Transit displays the results in one of the fuzzy-window types, either the fixed fuzzy window or the bubble window. – If Transit has pretranslated the segment and given it the status Check pretranslation, it uses update markers to indicate which part of the text you should check. Please refer to section 5.6 “Markups in the Transit editor” for more detailed information. – You may want to format the text manually in some instances, (e.g. mark as underlined or in italics). – If there are markups in the segment, it may be necessary to reassign, copy or delete them. – You can make comments on segments or search for comments. – If you want to join two sentences in the source language to make one translated sentence in the target language. 4 When you are finished translating the segment, confirm the translation by pressing the shortcut ALT+INS. Transit changes the status of the segment to Translated. – It is also possible to assign this status by clicking Confirm under Processing | Translate. – Transit moves the cursor to the next segment to be processed. In doing so, Transit bypasses all the segments which have already been translated or which do not have to be translated. 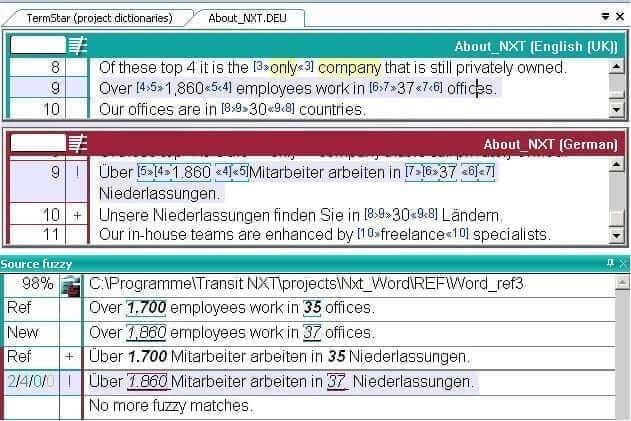 – Transit automatically searches the fuzzy index for fuzzy matches for the next segment to be translated. 5 Press the CTRL+ALT+BACKSPACE shortcut if you wish to undo the translation of a segment. Transit replaces the text translated by you or Transit with the text of the source language. This means you can also undo translations for segments which Transit automatically pretranslated during the import. 6 Continue translating as explained from point 1 onwards. Do not forget to save the language pair when you are finished translating it. Using this function, you can check whether the terminology from the project dictionaries has been used in the translation. Markup mode enables you to establish whether the markups in the source and target languages are consistent. Using segment status, check whether the text is completely translated. Please refer to section 6 “Quality assurance” for more information on this topic. This helps you to quickly see what you need to check and potentially change. Transit also displays the update markers in the Source fuzzy window . The display in the Source fuzzy window makes it possible to see where the differences lie between the new segment and the reference segment. To call up or update the Source fuzzy window, press the shortcut CTRL+ENTER. In the example in figure 5-11, the numbers in the active segment have been changed and the formatting has been changed from bold italic in the reference segment to just italic (for more details on the information given in the fuzzy windows, see section 5.4 “Dual Fuzzy windows”). Transit has carried over the translation from the reference segment and updated the numbers and markups according to what appears in the current segment. In the example in the Figure 5-12, the markup for italics for the number ’37’ in the current target-language segment is not inserted automatically. This markup must either be inserted manually or when checking the text using markup mode. You can find more detailed information on this in section 5.6.4 “Inserting and copying markups during translation” and in section 6.5 “Checking markups”. Transit automatically deletes the update markers if you assign a segment with the status Translated. Transit automatically deletes the update markers when you export the project. However, we recommend you delete the markers during translation or while checking the segments. In this way, you know which segments you have checked. During import, Transit breaks down the text into individual, easily-managed sections known as “segments”. These are the sections that you translate. These are also the sections of text which Transit searches for and replaces when it compares the text with existing translations. Transit saves information for each segment so you can track exactly whether and how the segment was translated. Transit displays this information in the scratchpad window. Under View | Segments, you can specify how Transit should display the segment status. You can automatically update the segment status during translation by confirming the translation for a segment with the keyboard shortcut ALT+INS, which sets the segment status to Translated. You can also manually assign the Translated status to a segment by selecting Processing | Translate | Assign status. We recommend that you ensure the segment status is automatically updated during translation. This allows you to track the course of the project and perform a statistical analysis of the translation. In Transit, it is possible to split a source language segment “on the fly” during translation work at a particular position in the segment. It is also possible to join a source language segment to the next. Splitting a segment may become necessary when Transit e. g. treats two sentences during segmentation as one segment because of a missing blank after the full stop in the original document. Splitting and joining of source language segments is only possible if the project has only one target language. The joining of source language segments works only within a paragraph. Joining segments beyond paragraph boundaries is not possible. How do I split a segment? 1 In the source language segment, place the cursor at the position where the segment should be split in two. 2 Right-click to open the context menu and select the Split segment option. Transit splits the segment in the source language as well as the target language window at the desired position and updates the segment numbers of the following segments in both windows accordingly. To undo the splitting, if required, follow the two steps described in “How do I join a segment to the next?”. If you split a segment that has already been translated, the target language segment is split approximately at the same position as in the source language. Likely, you may need to slightly adapt the two resulting target language segments where necessary. How do I join a segment to the next? 1 In the source language segment, place the cursor in the segment that should be joined to the next. 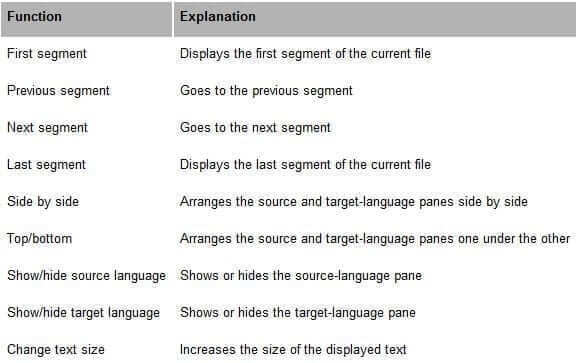 Transit joins the desired segment in the source and target language windows to the next segment and updates the segment numbers of the following segments in both windows accordingly. Transit gives you the option to virtually join segments. This may be of interest if content which is spread over two or more sentences or segments in the source language needs to be joined to become a single segment in the target language. This is predominantly the case with multilingual projects or for projects where the structure of the content is irregular (e.g. if sentences/units of meaning are interrupted by line breaks or similar). Using the Join function, Transit can combine such segments. In Transit, segments which are ‘virtually’ joined in this way form a single unit, thus allowing the content to be translated according to requirements. However, the number of segments remains unchanged, meaning that the segmentation of all language pairs is still uniform. This function can be selected either from the ribbon bar, via Processing | Translate | Join or via a context menu from the editor (Virtual segment join). A document in which the target language is English is being translated into German. How do I virtually join segments? 1 Enter the translation into segment 26 and mark the segment as ‘Translated’ using ALT+INS. 3 Place the cursor in the segment which contains the translation (seg. 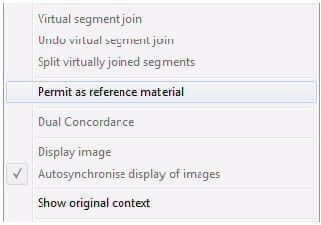 26) and select the option Virtual segment join from the context menu. In the segment-number column, you can see that the joined segments are assigned the number of the first segment, but that the number of other segments and their numbering have not changed. If necessary, to separate the joined segments again, either select Processing | Translate | Undo join or select Undo virtual segment join from the context menu in the active segment. This function can only be used for adjacent segments. There must not be any segments only containing markups between these segments. Transit also treats virtually joined segments as a single unit when they are used as reference material. If required, you have the option to split virtually joined segments again at a later point in time. 1 Place the cursor at the position where the virtually joined segments are to be split (in the example: behind „Transit spart Ihnen Geld und“). 2 Select the option Split virtually joined segments from the context menu of the active segment. Transit splits the virtually joined segments at the cursor position. The segment part in front of the cursor mark stays in segment 26, the segment part behind the cursor mark is taken over to the following segment 27. If the virtually joined segment consists of more than two joined segments, these segments continue to stay virtually joined. You may also split them, if needed. It is possible to not permit segments to be used as reference material for certain reasons. Due to an incorrect formatted original document a sentence is divided into two segments. Between the two segments there is a segment that only contains markups. Due to the markup segment, joining the two text segments virtually is not possible. In this case, it is possible to enter the translation of the complete sentence into the first target segment, empty the second target segment, and then not permit the two text segments as reference material. 1 Right-click the desired segment in the target-language window. 2 In the context menu, select the Do not permit as reference material entry. The segment is not permitted as reference material and assigned the Not as reference access status. The access status is displayed in the Access field of the Segment info window. 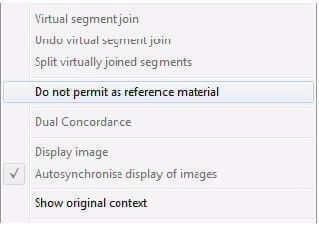 2 In the context menu, select the Permit as reference material entry. The segment is permitted as reference material again. The context menu entry Do not permit as reference material is greyed out if the segment has the access status Read only. For particular file types, Transit offers static or dynamic viewers. Those viewers can display the document text you are translating in the Transit editor in the original layout. In a static viewer the source-language document text is displayed in the original layout. 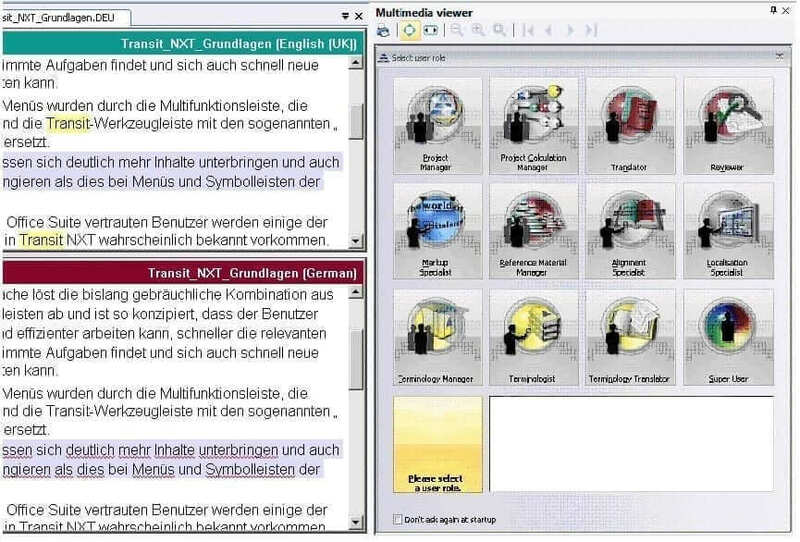 In a dynamic viewer the current status of the translation into the target language is displayed as a preview in the original layout. In Transit, these viewers are conceived as ‘floating windows’ which can be called up via the context menu of the Transit toolbar (see the instructions under “How do I select a viewer?”). How do I select a viewer? 1 Move the mouse pointer to the area to the right of the resource bar and right-click to open the context menu of the Transit toolbar. Transit displays the context menu of the Transit toolbar. The bottom section of this menu displays a list of the available viewers. 2 Select a viewer by left-clicking on the corresponding icon. Transit opens the window for the viewer selected. The viewers take the form of floating windows. You can also change the display mode of the viewers from ‘floating’ to ‘permanent’, alter their size and position as desired or dock them with the user interface. If a PDF file of the original document is available, it can be displayed in the PDF viewer. The view of the source document in the PDF viewer is synchronised with the view of the language pair in the Transit editor. This means, during translation, you can see in the PDF viewer where you are in the document at any given moment by means of a red arrow. This allows you to quickly determine, for example, whether the text to be translated next is a heading or an index entry, and to translate the text appropriately. You can display a preview of the text in its the original layout, showing the latest status of your translation into the target language. This preview option is currently available only for Word files. 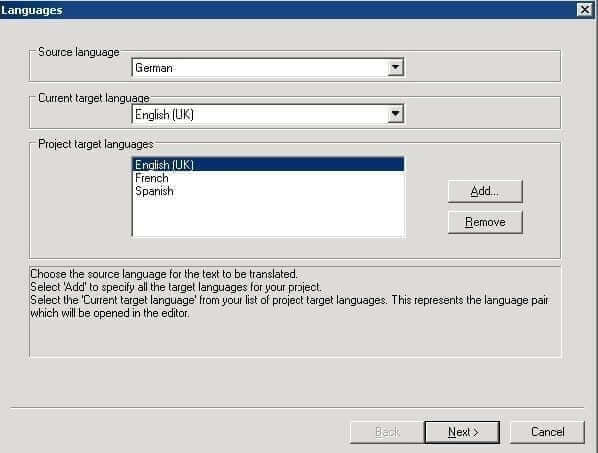 – Open the context menu of the target-language section of the Transit editor. – Select the Display preview in Transit option. No PDF synchronisation available for the file type selected. In order to use the PDF viewer in a translation project, the PDF file must be placed in the working folder which contains the associated language pair. It is also important that the PDF file have exactly the same name as the original file or the Transit language pair. Please make sure that the PDF file is located in the working folder. 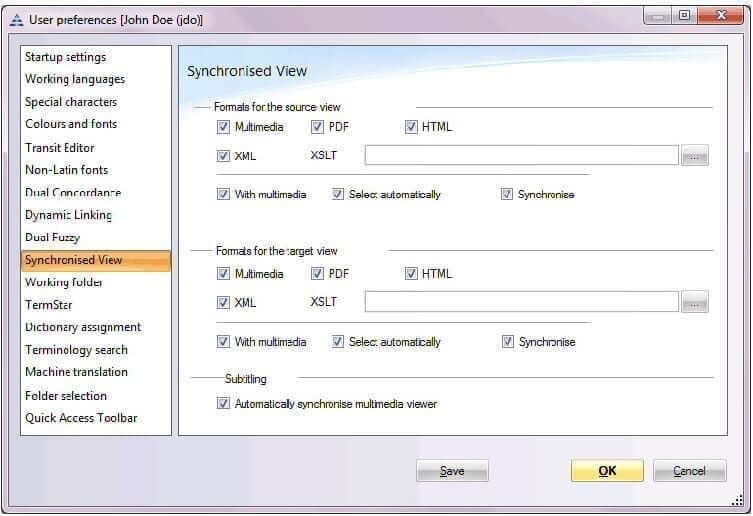 It is also possible to view the text synchronised in the editor and original format for projects involving HTML files or user-defined, custom XML files. In addition to the source-language, the HTML viewer can also preview the target-language version of the original file, thus providing a continually updated view of the latest status of the translation. This means that the target-language version is updated dynamically. The HTML viewer does not support the selected file type. Please note that when packing or forwarding Transit projects containing image information for the Multimedia viewer, the cod file must also be packed. The cod file contains the image information and must therefore be included in the project file. Only then will the recipient of such a project be able to display the images in the Multimedia viewer (information on packing and forwarding project files can be found in section 4.3 “Packing a project” and 4.7 “Forwarding a project”). When translating MS Office files (Word, Excel, PowerPoint), you have the option to open a preview of the file from the Transit editor in the respective MS Office program, showing the latest status of your translation. When doing so, the respective MS Office program is opened in the foreground. How do I open a preview of an MS Office file in the respective MS Office program? 1 Right-click on a segment in the target-language pane of the Transit editor. 2 From the context menu which is then displayed, select the option Display preview in Office application. Transit opens the respective MS Office program and displays a preview of the file, showing the latest status of your translation. The segment on which you right-clicked to open the preview, is highlighted. If this belongs to a paragraph, the entire paragraph is highlighted. This enables you to see at a glance where you are in the file. Alternatively, for MS Word files, you may open the preview in the Transit window PDF viewer/Word preview (see section 5.9.1 “PDF viewer/Word preview”). How do I define the user preferences for Synchronised View? 2 Select the Synchronised View option. Transit displays the Synchronised View screen of the User preferences window. When translating the subtitling of a movie, Transit can automatically synchronise the playback of the movie in the Multimedia viewer. Use this option to specify whether a segment should be played back automatically in the in the Multimedia viewer as soon as you place the cursor in it. 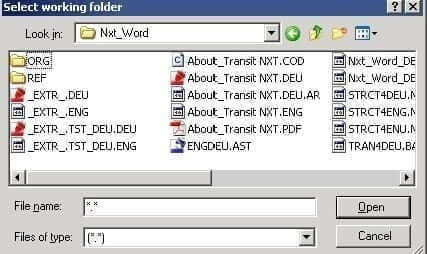 A key component of Transit is the TermStar NXT terminology management system. In TermStar NXT, you can create dictionaries and save general or project-specific terminology to them. Terminology search (see section 5.7.3 “Searching for terminology”). View terminology suggestions in dictionaries for the active segment and transfer these to your translation (see section 5.7.6 “Transferring a translation from the dictionary”). Add terminology from Transit to a dictionary (see section 5.7.7 “Adding terminology to the dictionary”). Check terminology to determine whether you used the translations from the dictionaries (see section 6.6 “Format check”). Automatically accept all terms from the dictionary (see section 5.7.8 “Accepting all terms”). Add specialist terminology from a language pair to a dictionary (see section 3.11 “Creating, editing and managing dictionaries”). 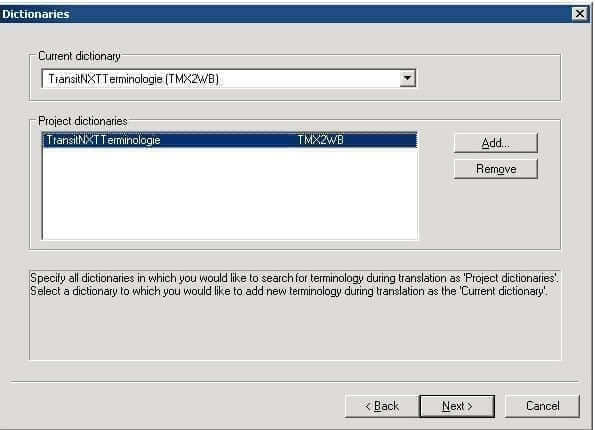 If you have already created a dictionary for your terminology in TermStar NXT, you can assign it to a Transit project. If you do this, Transit also opens the dictionary simultaneously with the project. If you add terminology to a dictionary, Transit saves the new terminology to the ‘current‘ dictionary. This dictionary can be defined in the project settings. Please refer to section 3.6.13 “’Dictionaries’ project settings” for more detailed information on how to assign a dictionary to a project and how to specify your ‘current’ dictionary. You will find detailed information on TermStar NXT in the TermStar NXT User’s Guide. With Dynamic Linking, Transit can display all the segments which contain particular pairs of terms. This quickly and easily provides you with an overview of where, and in what context a source-language term and its translation are used. It also allows you to effortlessly obtain up-to-date examples at any time in the context of the current project for terminology maintenance purposes (see section 5.11 “Dynamic Linking”). 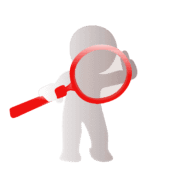 Information on searching for terminology in TermStar can be found in the TermStar NXT User’s Guide, section 5.4 “Searching for a word”. Using the TermStar Gate plug-in, you can search for translations or enter terminology from Microsoft Word or Adobe FrameMaker. This gives Microsoft Word or Adobe FrameMaker direct access to TermStar NXT and thus your local project dictionaries. 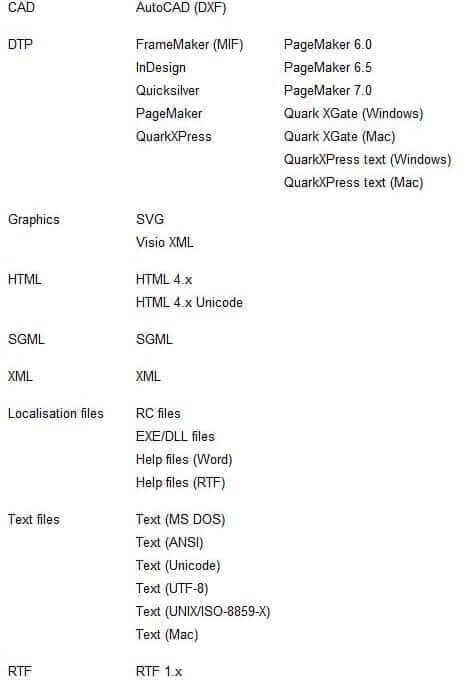 Information on these plug-ins you find in the “TermStar Gate for Word – Installation & Usage” and “TermStar Gate for FrameMaker – Installation & Usage” documents. How do I use the “Web search” tool? 1 Open the Web search window (detailed information on calling up tools can be found in the section “How do I display a floating window?”). Alternatively, it is also possible to open this window via Windows | Open | Web search. Transit displays the Web search window. – Select the services which you want to search from the Search in list. Select a service by checking the box on the left of the service name. Alternatively, you can also select all services by clicking on the Check all option in the icon bar. – Select Source language from the icon bar if you want to search for the search term in the source language of the project which is currently open. Select Target language from the icon bar if you want to search for the search term in the target language of the project which is currently open. – Enter a search term into the field and press the Enter key or click on Search. 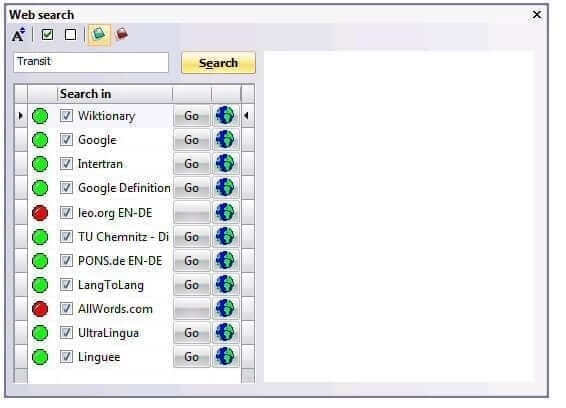 If one of the services finds the search term, a green light appears to the left of the corresponding list entry, and the word Go appears to the right (next to the globe icon). If a red light appears instead, then the search query returned no results for this service. – You can display the search results for a particular service by clicking the Go button. Transit displays the search results for the respective service in the right-hand portion of the Web search window. You can call up the website of the search service also without carrying out a search. To do so, click on the globe icon in the corresponding list entry. No suitable search engine could be found for the selected language. When you select a search result, an error message may appear in the Web search window referring to a script error in the page being displayed. To prevent these error messages from being displayed, script debugging must be disabled in Internet Explorer. To do this, select the Disable Script Debugging option under Settings | Control Panel | Internet Options | Advanced. In the user preferences, you can define how and which folders to search for terminology. You can also determine how terms are displayed in the language pair and the Terminology window. How do I configure the user preferences for Terminology search? 2 Select the Terminology search option. – Morphology-based – Transit carries out a morphological search which means that during search for dictionary entries all inflected forms of a search term (i. e. declined or conjugated forms) are taken into account. German, English, French, Italian, Spanish, Basque, Catalan, Czech, Danish, Dutch, Hungarian, Norwegian, Polish, Portuguese, Romanian, Russian, Slovak, Slovene, Swedish. 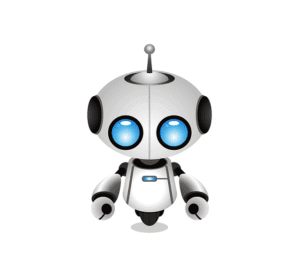 – Exact matches only – Transit performs a search for terms which match the search term precisely. This option disables morphological search; the option Morphology-based is deselected. – Match case – Ignore – Transit ignores differences in case. – Match case – Match, but ignore for 1st character – Transit ignores a difference in the case of the first character. – Match case – Match – Transit pays attention to differences in case. – Regard formatted strings from the working folder – Transit searches the working folder for terms containing formatting information, for example, italic, bold or underline and displays the source-language term and its translation in the Terminology window. To distinguish these terminology suggestions from found dictionary entries in the Terminology window, they are not marked yellow, but blue. – Regard formatted strings from the reference material – Transit also searches the reference material for terms containing formatting information, for example, italic, bold or underline. 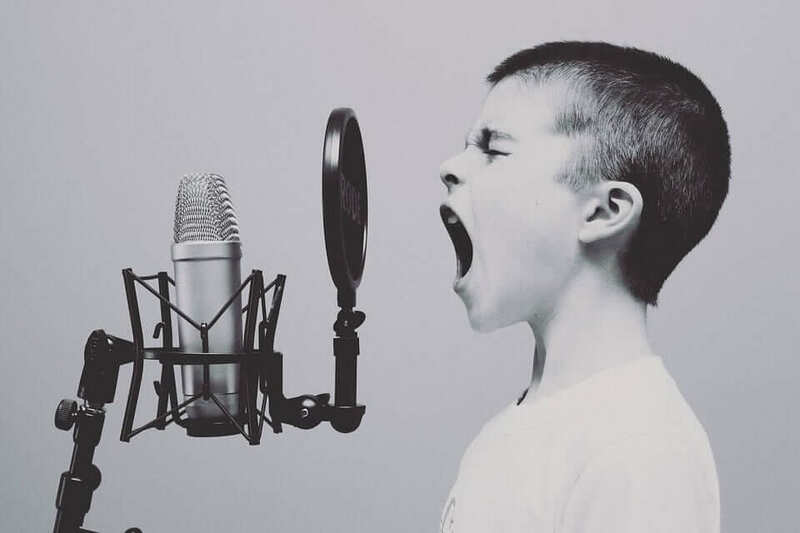 – Source language: Regard disallowed terms – When background scanning for dictionary entries and performing the terminology check, Transit also takes into account data records that contain the term used in the source language as a disallowed term. In case of documents using incorrect terminology we recommend to use this option. This allows you to take into account the terminology quality of the documents to be translated and optimise the terminology check. In case of documents using correct terminology we recommend not to use this option. 4 In the section Highlight in language pair, you can specify which terms should be highlighted in colour in the language pair. – all – All terms are highlighted. – if target language exists – A term will be highlighted only if there is a translation for it in the currently selected language. – if target language is missing – A term will be highlighted in the source-language segment if it has no translation in the currently selected target language. 5 In the Display in “Terminology” window section, you can specify which terms will be displayed in the Terminology window. – all – All terms are displayed. – if target language exists – A term will be displayed only if there is a translation for it in the currently selected language. Transit automatically searches the project dictionaries for appropriate entries while you translate. By default, Transit carries out a morphological search and also finds declined or conjugated forms of existing entries. If required, you can determine that Transit displays only exact matches. Replace a word with its translation from the project dictionary. Select the translation which will replace the word, if more than one translation is found. Insert a translation without replacing a word. Transit can also automatically accept all terms from the dictionary. Please refer to section 5.7.8 “Accepting all terms” for more detailed information on this topic. With Dynamic Linking, Transit can display all the segments which contain the suggestions from the dictionary. This quickly and easily provides you with an overview of where, and in what context a source-language term and its target-language equivalent are used. It also allows you to effortlessly obtain up-to-date examples at any time in the context of the current project for terminology maintenance purposes (see section 5.11 “Dynamic Linking”). How do I replace a word with its translation from the dictionary? 1 Place the cursor onto, or at the beginning of, the word you wish to replace. Transit shows the dictionary entry in the Terminology window. Transit replaces the selected word with the translation from the project dictionaries. If you also want to change the case of the initial letter when inserting the term, press ALT+SHIFT+T instead of the shortcut mentioned above. How do I select the term to replace a word when there are several dictionary suggestions? 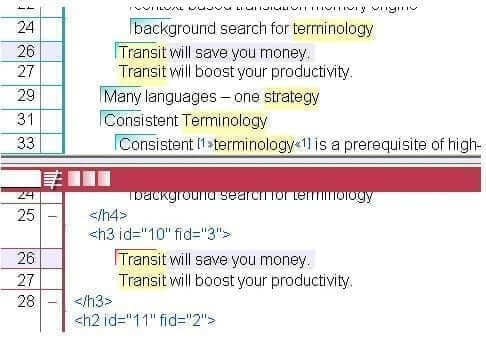 Transit shows the dictionary entries in the Terminology window. 2 To accept the translation, press the keyboard shortcut ALT+K, <Letter>. 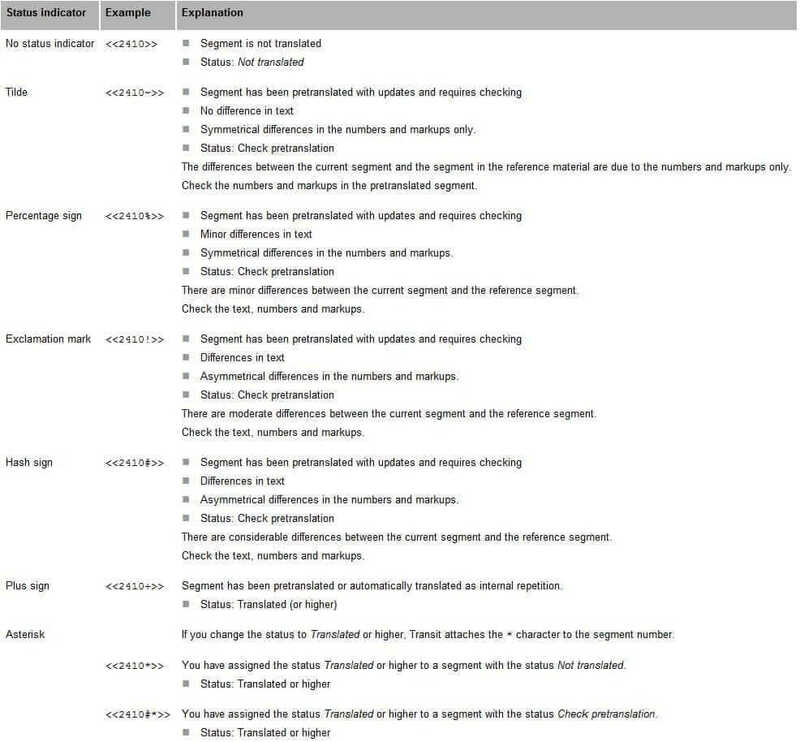 <Letter> here refers to the letter which is in front of the particular translation in the Terminology window. 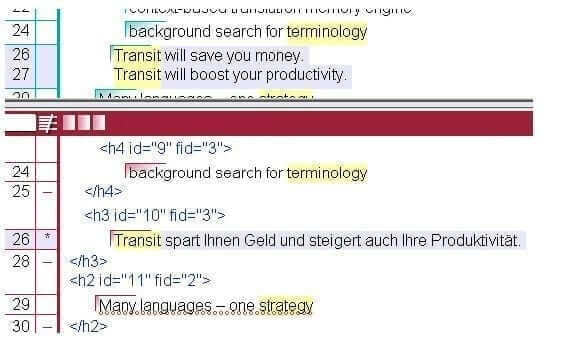 Transit replaces the selected word with the translation selected. If you also want to change the case of the initial letter when inserting the term, press ALT+K, SHIFT+<Letter> instead of the keyboard shortcut mentioned above. How do I insert a translation from the dictionary without replacing the source-language word? 1 Position the cursor at the position at which you wish to insert the translation. 2 To accept the translation, press the shortcut ALT+G, <Letter>. here refers to the letter which is in front of the particular translation in the Terminology window. Transit inserts the translation selected at the cursor position. If you also want to change the case of the initial letter when inserting the term, press ALT+G, SHIFT+ <Letter> instead of the keyboard shortcut mentioned above. Transit highlights a word if it finds it as a source-language entry in the dictionary. This is the case even if there is no entry in the dictionary for your current target language, (but for other languages which you are not working with at the moment). If you then want to transfer the (non-existent) translation from the dictionary, Transit inserts a space because no translation is available. – In the Terminology search user preferences, you can select the if target language exists option under Display in “Terminology” window. The Terminology window will then only display the entries which have a translation in the currently selected target language. – You can create a separate dictionary containing only data records which have a term in both the source and target language. You can add terminology to the current TermStar dictionary while you are translating in Transit. Select a word in the source language and its translation in the target language and add it straight to the current dictionary as a new data record. Select a word and use the rapid entry function to add it as a new data record or a new entry to a dictionary. With the rapid entry function, you can add extra information to the dictionary, apart from the term (e.g. subject, context). In addition, you can also specify to which project dictionary the terminology should be added. You can select words in the source and target language and immediately add them to the dictionary as a new data record. With this function, you can only specify the source and target-language terms for this entry or data record. If you add a selected term to the dictionary, Transit always saves it to the ‘current‘ dictionary. Which dictionary this is can be specified in the project settings (see section 3.6.13 “’Dictionaries’ project settings”). Please ensure that you have specified the required dictionary as the current dictionary. How do I add selected terms to the current dictionary? 1 Select the term in the source language and the translation in the target language. 2 Select Terminology | Creation | Insert selected. Transit inserts the pair of terms into the dictionary as a new data record. Data record "< …>" already exists. Entry "< …>" already exists. – New data record – The terminology is added to the current dictionary as a new data record. – Insert – The terminology is appended as a new entry to the existing data record in the current dictionary. – Cancel – No terminology is added to the current dictionary. You can add words to the current dictionary using the rapid entry mode. You can specify these fields in the dictionary settings. Please refer to the TermStar NXT User’s Guide for more detailed information. New data record – TermStar NXT creates a new data record with both entries. Always create a new data record if the terms have a different meaning than the existing data record. 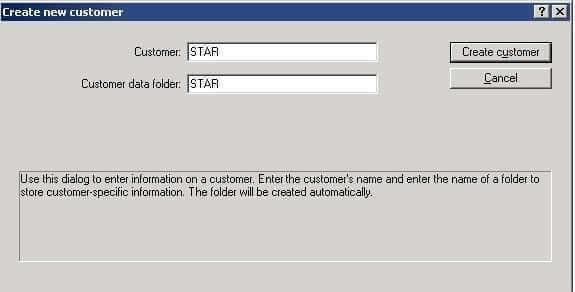 Insert – TermStar NXT inserts the new term as a new entry in the data record of the existing term. Always insert an entry into the existing data record if the term has the same meaning as the existing data record. When making new entries, TermStar NXT only checks the dictionary to which you are adding the new entries, i.e. the dictionary that you selected in the Rapid entry window. Entries which exist in other dictionaries are not taken into consideration. How do I add terminology to a project dictionary using the rapid entry function? 1 Select Terminology | Creation | Rapid entry. 2 Select the dictionary to which Transit should add the terminology. 3 Correct the source-language or target-language term, if necessary. 4 Fill in the other fields, if necessary. 5 Confirm your entry with Save. – New data record – The terminology is added to the selected dictionary as a new data record. – Insert – The terminology is appended as a new entry to the existing data record in the dictionary selected. – Cancel – You return to the Rapid entry window without having added the terminology to the dictionary. As the Rapid entry window remains open, you can create further data records. To close the Rapid entry window, click Cancel or click Save if all the fields are empty. The Terminology window can also display terminology suggestions based upon already translated terms from your working folder or in the reference material that contain formatting information, for example, italic, bold or underline. Terminology suggestions based on markups are indicated in blue in the Terminology window. 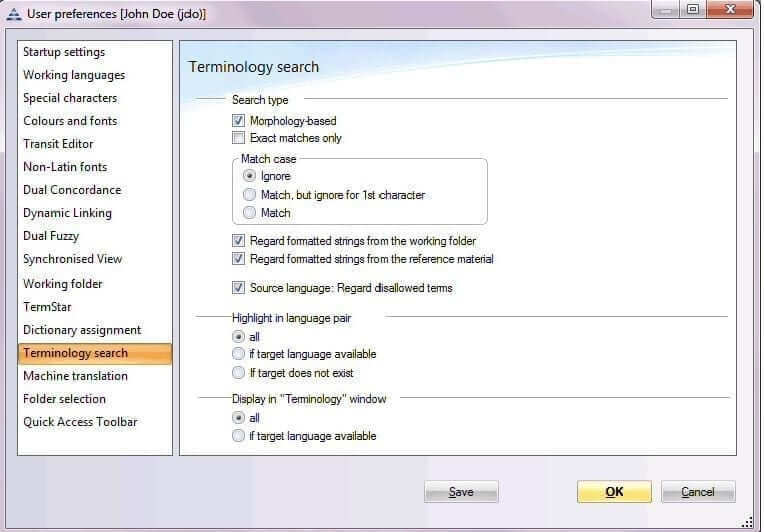 For the Terminology window to display terminology suggestions based upon markups, you need to select the options Regard formatted strings from the working folder and/or Regard formatted strings from the reference material in the User preferences for Terminology search (see section 5.7.5 “Terminology search – User preferences”). You can either immediately accept these terminology suggestions into the current dictionary as a new data record, or use the rapid entry function to add them to a dictionary as new data records or new entries. How do I add terminology suggestions based on markups to a dictionary? 1 Open the context menu in the Terminology window by right-clicking on a terminology suggestion (highlighted in blue). 2 From the context menu, select either Insert terminology in current dictionary or Rapid entry. From this point, the procedure is exactly the same as that described in the sections “How do I add selected terms to the current dictionary?” and “How do I add terminology to a project dictionary using the rapid entry function?”. Transit can automatically accept all terms from the dictionary for segments which are not translated. 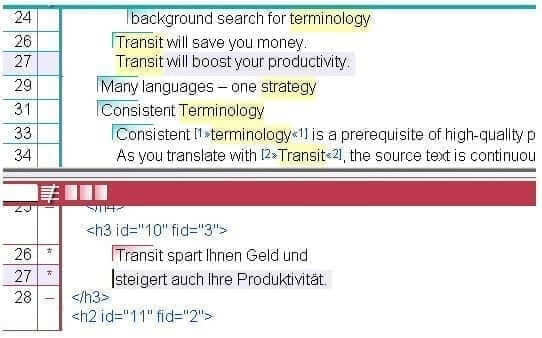 Transit then automatically inserts the translation of the source-language terms it finds in the dictionary into the target-language segment. If Transit finds several translations in the dictionary for one source-language term, Transit always takes the first translation. 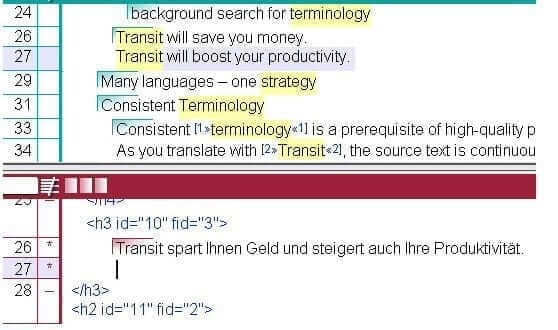 If Transit finds a source-language term in the dictionary but no target-language translation, Transit leaves the source-language term unchanged. How do I accept all terms for ‘Not translated’ segments? 1 Specify via Terminology | Use | Auto-insert if you want to accept the terms just for the active segment or for the whole file. – Select the File option if you want to accept the terms for the whole file. Do you really want to accept the translation for all words found in the dictionary? 2 If you are sure you want to accept all the terms from the dictionary, click Yes. Transit replaces all the source-language terms in segments which are not translated with the target-language terms from the dictionary. All terms found in the dictionary have been inserted.